In Novosibirsk, Evgeny Koudryavtsev was inspired "by a wonderful teacher who engaged students to learn more about economics and finance." After completing his undergraduate education in Moscow, Evgeny obtained his first position with the J.P. Morgan investment banking team in London. "Thanks to my great mentors, early on I got a lot of responsibility and worked on a few landmark transactions," he says, "including the world's fifth-largest IPO." Seeking more buy-side experience, Evgeny was one of the few people hired for the newly opened office of TPG Capital in Moscow in 2008. "It was a super-exciting time," Evgeny says. "I loved the entrepreneurial environment in the office and learned a lot from the exceptionally smart people I worked with. As TPG was the only large-cap private-equity firm with presence in Russia and Eastern Europe, many successful entrepreneurs came to talk to us about bringing their businesses to the next level. I was struck by how much room for development most of the businesses had in terms of top-line growth and operational improvements." His experience also coincided with the financial crisis. "Early in 2009, understanding what the financial crisis meant for the future of economies in emerging Europe was absolutely critical" says Evgeny. "I spent a few weeks on macroeconomic analysis, so that TPG could get comfortable investing in businesses, many of which were desperate for primary capital at the time. In the fall, TPG closed its first deal in Russia." Evgeny decided to invest time in an MBA to learn the best practices in general management. "In investing, it is important to evaluate the quality of management teams and the way businesses are run," he says. "Due to globalization, these skills in emerging markets are becoming more valuable, since industries are getting competitive and companies mature more quickly. When you've worked in finance, general management perspective is something you lack." Evgeny chose HBS since it "fits my aspiration best, given the school's focus on developing general-management skills and has the strongest reputation internationally." "I also appreciate the focus on leadership and case-based learning," says Evgeny. "After doing more than two-hundred cases in my first year, I feel I've learned a lot about companies from different industries and countries. Despite the fact that all of the companies had specific business issues, the case method pushes you to observe historical patterns and develop a common framework for finding solutions. This is something that I believe will be valuable in my future career." In addition to his enthusiasm for the Soccer Club (Evgeny plays forward for the HBS team) and the China IXP "that helped me understand the political and social aspects of China's success story," Evgeny has special praise for the way his wife, Anya, has been made welcome at Harvard. She lives with Evgeny on campus and studies at the Harvard Extension School. "Anya's taking marketing courses," Evgeny says, "and she sees many of the same cases I've seen at HBS. It's helped her become part of the HBS experience." Anya is the section partner representative and a member of the Partners Club where "she has made many friends." After years of work, Evgeny says that studying at Harvard "has been a great opportunity for us to spend time together and find new friends. I would encourage international students to bring their partners." This summer, Evgeny will go to London where he will intern with Warburg Pincus, a large-cap private-equity firm. 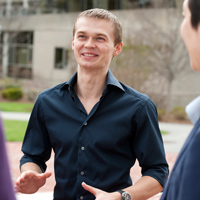 After graduation, Evgeny's goal is "to help bring companies in developing markets to new levels. I see a lot of entrepreneurs who need help; Western practices and perspectives adjusted to local business and cultural specifics can lift companies into greater profitability."